The other day at work I managed to crash the credit card application server, a register, the digi (handheld we use for printing price tags), drain the battery on another digi and my cell phone, and crash the time clock. Of course, all of these devices were miraculously in working order as soon as I left the room (except the dead batteries. Those still had to be charged). It's my senior year of high school all over again. Our first semester, we were doing design work on PCs, and then we were supposed to switch to Macs for the next semester. Well, in four months I went through four PCs. At first the IT guy tried to tell me it was a virus, but that's impossible when the computer wasn't even hooked up to the internet. Every time I sat down at the darn thing, it would give me the blue screen of death or a random error message that the IT guy had never even heard of. He'd fiddle with it, it would go back to normal, and then fifteen minutes later it would freeze and die on me again, until the teacher moved me to another computer. I'd get a few more days, maybe a couple of weeks out of it, rinse and repeat. Eventually, there simply weren't any other computers in the classroom for me to try, so the teacher put me on a Mac. I've been stuck on the brand ever since, since even my seven year old laptop with the dead battery and peeling keyboard plate is still able to limp along and doesn't crash every time I walk into the room. You see people, there is a reason I like typewriters. I'd be typecasting right now if others in the household weren't trying to nap. The cell phone issue, which has been ongoing for a couple of months, was finally resolved yesterday when I got a new phone. It is metallic blue--in fact, it is the exact same color as my camera and the cover I have on George. It would also match my ipod case, except that the metallic blue part peeled off and left me with clear plastic. But considering how hard I am on my ipod, I'm just happy it's still there. Speaking of matching sets, I started another knitting project last night (not that I needed one). Since my camera cord is still MIA, I'll just have to tell you: I'm making a steering wheel cover for my car. I'd bought a skane of burnt orange Red Heart yarn a couple of months ago to make cargo nets for my car, and it was exactly the same color as the paint. But, I ended up with a ton of yarn left over and nothing to do with it, since it is a very particular color and not one I'd normally choose. Alice recommended seat covers, which I thought might be overkill and a bit more work than I'm willing to do (also, it would mean buying more yarn and I'm having enough trouble using up what I've got), so I settled for a steering wheel cover. It's about half done, mostly knit up last night while I was watching Mary and Max, a little stop-motion film recommended by another typospherean, though I can't remember who at the moment. I have to say, I found it absolutely tragic. I had to watch another movie afterward just so I could go to bed feeling something other than horribly depressed. I settled on Ramen Girl for that one, and while the beginning and middle of the movie were still less than cheerful, it at least had a happy ending. Honestly, I don't know who decided to label those two as comedies. I think they just tacked a list on the wall and threw a dart at it, because they weren't funny to me. Something which did make me laugh, however, was a posting I found online for a condo for sale. Missouri and I have been having a horrible time finding an apartment to rent in our area that fits within our budget. But, the housing crisis seems to be even worse where we are and there are pages of listings online for houses in our country for sale for about the same price as a new car (not my car, mind you, since it's still a budget vehicle, but there are still plenty out there for under $100,000. Five years ago, this would be unheard of). One such example has such a disjointed paint job in the kitchen, I burst out laughing as soon as I saw it. 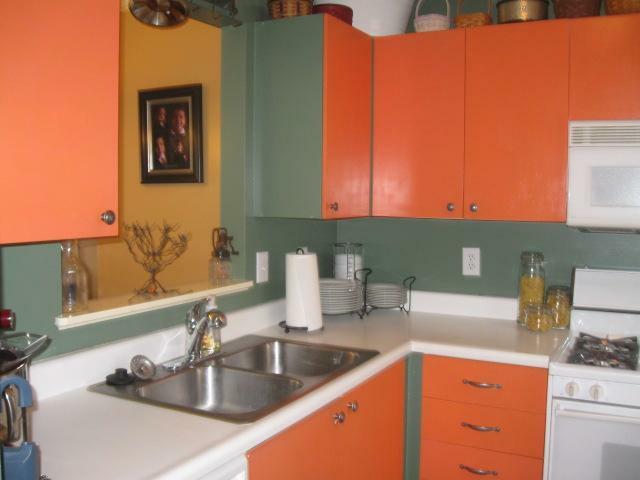 It's so awesomely bad that I almost want to buy the place just to repaint it (and hey, if the price is right...). You can find the image here. But I'm not linking to the listing, just in case we do decide that buying is the right option.